Note : On Sunday, January 20, there will be a Tunnerminnerwait & Maulboyheenner Commemoration, which will be held at the Tunnerminnerwait and Maulboyheenner monument at midday at the corner of Victoria & Franklin Streets. All media inquiries regarding the Melbourne/NarrmBirraranga event should be addressed to Warriors of the Aboriginal Resistance (WAR) : warnarrm [at] gmail [dot] com. • Community radio station 3CR will be bringing youse news & views throughout the day. 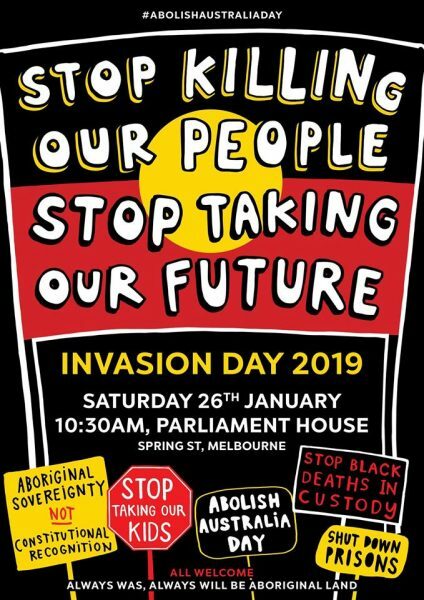 See also : January 26: Join the Invasion Day protests and events, Green Left Weekly, January 17, 2019 | This Invasion Day, march for the future, Celeste Liddle, Eureka Street, January 22, 2019. This entry was posted in History, Media, State / Politics and tagged AntiColonial Asian Alliance - Naarm/Melbourne, Australian Jewish Democratic Society, Invasion Day, Jews against fascism, Muslims Say No To Australia Day, No Pride in Detention, Warriors of the Aboriginal Resistance. Bookmark the permalink. AntiColonial Asian Alliance –… get real… these arseholes come into Campsie now and again, paste up a couple of posters and then run off. Koreans and Chinese think these people are borderline retards or else are yuppie white ‘Annandale refugees’. The hate whitey posters impress no one, go back to your bum-squashed avocado on wheat-free bread and your low-fat decaf soy lattes.